We just finished this sensational dinner and so I just had to share it with you all! Eye fillet steak cooked to perfection by my hubby, topped with mushrooms (they are hiding a bit in this photo) and sweet potato spiral crisps. It was served with a simple green salad on the side. The crunch of the sweet potato makes this a complete winner for either an ‘above average’ mid week dinner, or a great meal for entertaining! Fry onion and garlic in olive oil. Add mushrooms and vegetable stock and cook until the mushrooms are soft. Add coconut aminos/soy sauce and stir though. Spread out on lined baking tray and bake in the oven (180C/350F) for 25 mins or until they have turned crispy but not burnt. You may need to toss them around mid-bake so the edge bits don’t burn. Grill or panfry your steak to your liking whilst the sweet potatoes and mushrooms are cooking. 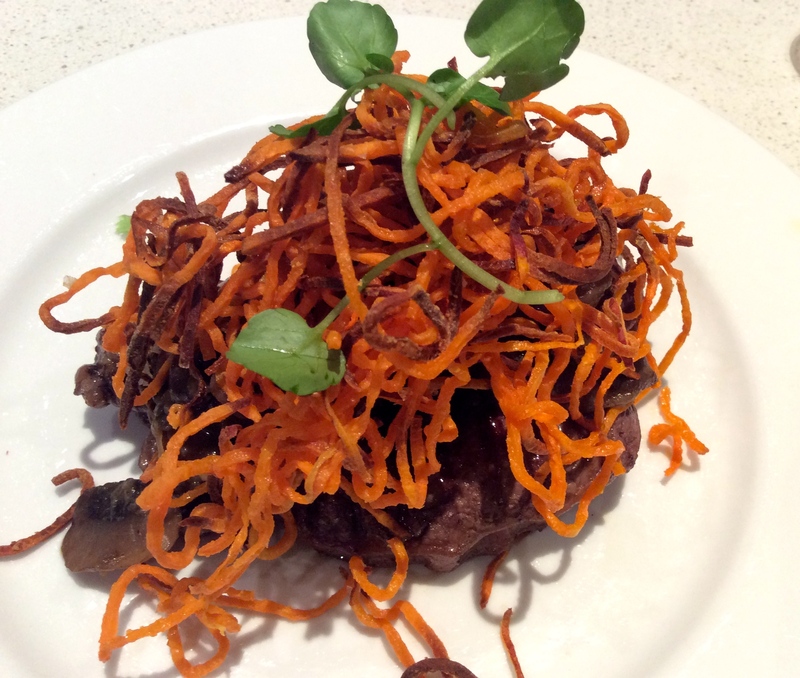 Place the steak on the plate, top with mushrooms and sweet potato crisps and serve with a green salad. YUM! This is my spiraliser – you can buy on eBay or I got mine from local farmers markets.